The Fall Delayed Harvest trout fishing season NC is shaping up just fine with plenty of water and cooler temps the past few weeks. Irma did not impact the area around Bryson City, NC. Many of our neighboring Counties and friends in GA, TX, and FL were not as lucky. Our thoughts go out to them as they deal with flooding and wind damage. I am thankful for the conditions heading into Fall! Fall has always been my favorite time of year for playing with big fish that like to migrate! When the conditions get just right it is hard to beat the dry fly game on the wild streams with a large October Caddis pattern. In fact, a half dozen of my personal best Brown trout has fell victim to that pattern over the years in the Great Smoky Mountains National Park. Streamer fishing can also provide an exhilarating adrenaline rush when the timing is right. Some of the largest record Browns have also fell victim to this when conditions are right. Listen to the reel scream as “old square tail” works you all over a run before coming to the net. The Fall season provides the most beautiful scenery of the entire year. It is the culprit of longer lines at local eating establishments, more folks out on the trails and rivers, and an increase of traffic in the “Trout Mecca” town of Bryson City, NC. 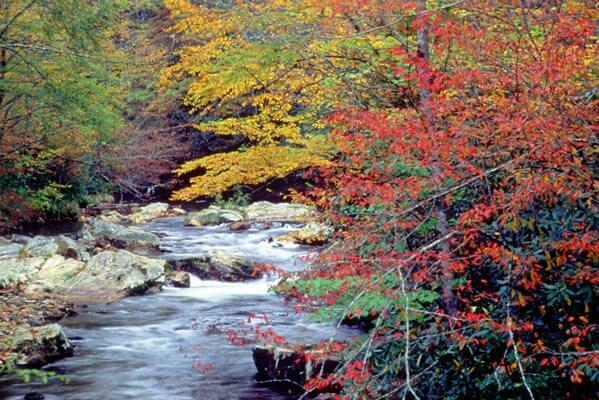 We love the Great Smoky Mountains National Park and all of the wilderness in the county. Thanks to the increase of folks during this gorgeous time of year they enable us to do what we love! Fall is also very busy with float trips on the Tuckasegee River Delayed Harvest right through the town of Bryson. We are consistent at putting up big record numbers of fish during every guide trip! Big fish also makes for some very happy clients. We have the highest repeat customers in the industry! Sharing information has been the key to success over the past 30 years! We are the original outfitter in the area since 1987 and experience matters! Beginner fly fishers can expect double-digit trout numbers landed. The seasoned anglers can expect upwards of triple-digit numbers of trout! Mac Brown Fly Fish regularly sets the levels of par for fly fishing instruction and guide trips in Bryson City! I would not want you to be one of the folks that saw a Google ad and had a poor experience on the stream. There is great value for you the client and this intrinsic experience. Book now as the Fall calendar fills up quick.